Strange how these barbaric and bloodthirsty terrorists had the far-sighted wherewithal to plan their attack according to the above valid assessment of their intended target. I'd imagine seeing the brutality of the NZ attacks would induce the desire for blind revenge on a t1t-for-tat "Western" target. It's almost as if they're acknowledging the fact that attacks on Sri Lankan Christians would cause "less" of an outcry than if they'd walked into a church in leafy Sussex and detonated their explosives. What was stopping them from doing so? Why would these terrorists care about potential blow-back for Muslims in the West when brutal and savage sectarian violence between Islamic sects has been a mainstay of their religious activities for centuries? These so-called men of God will be the death of us all. Makes you think: treasure Sikh scriptures and preserve their authenticity. God knows how devils in our community will try to alter or erase sections of Gurbani for various nefarious reasons over the centuries to come. Vigilance is key. Gurdwara Charan Kanwal in banga Nawanshahr is a lesser known historical gurdwara. This gurdwara sahib marks the site where Guru Hargobind sahib ji came and rested for a month after a battle where they killed painde khan. Guru sahib rested here for about a month along with his soldiers as well as Guru Har Rai sahib ji, Guru Tegh Bahadur ji and baba Gurditta ji as children. This place was blessed with the visit of 3 gurus. The Gurdwara was built by Maharaja Ranjit Singh. This Gurdwara sahib is like a 5 min drive from my nanke. Not many people seem to know about it. No !! (This is a long post based on my knowledge but interesting story) Islam is cousin sibling of Judeo-Christian religion. I am using the word "judeo - christian" because both judaism and christianity are the same lineage . Jesus is an indirect descendant of Abraham/Ibrahim by his son Isaac whom he had through his first (respected) rich wife "Sarah/saayra" . Jews (Israelites) are descendants of Isaac (Ishaq). Arabs (muslims) are descendants of Abraham by his elder son Ishmael (Ismail) whom he begot through his maid wife "Hagar" (Hajraa) ALL of these are biblical and therefore quranic figures. The story goes like Abraham wanted a son , but was not having any . So his first wife Sarah gave her maid Hagar to Abraham for marriage so he may beget a son. Hagar bore Ishmael (later on to become father of arabs and the lineage of muhammad) . BUT , here comes the twist , those both developed 'sautan' feelings soon. Sarah couldn't tolerate that this maid servant bore first son for her husband Abraham. And therefore Sarah said to Abraham to leave this 'sautan' and her son 'Ishmael' far away in the desert and Abraham did , telling the hagar and ishmael that this is god's will . So he left them in desert of mecca. ! Sarah meanwhile haves a son of her own . Names him Isaac (Ishaq) who would later go on to become the father of Israelities / jews. When Abraham asks god , what do you have in store for both of my sons ? God says "I will make Isaac a very prospering nation" and this promise of God is true because jews / israel is world leader in technology , etc. And Abraham asked "What about my son Ishmael?" God says "I will make him father over many nations. He will multiply many times" . And its true today because Muhammad was born in a lineage of Ishmael and muslims have many countries for them today. NOW , these 2 brothers are fighting on a global stage. Old sibling rivalry gone crazzyyy ! (Even maskeen ji makes a reference to this in one of his katha about 1984 op bluestar, referring to how jews and muslims are infact bros but at each other's throats and thereby silently implying , same is the case with Hindus and Sikhs too nowadays, because our gurus are anyways descendants of Raam via lav kush , its in dasam granth btw) . Now to answer your question , is Islam the sect of christianity . Nope . Muhammad was the promised 1,25,000-th prophet god had to send to the world . It was all a part of god's grand plan. So muslims are in a way right in saying "he is the seal of all prophets" because he was the "last prophet" , but not the last guru !! When god reveals quran to muhammad, there's obviously a recap of all the previous prophets in the region and hence the name of those biblical figures repeat up in the quran as a confirmation and a tribute to those noble souls. Its just like how "dhur ki baani" SGGS remembers Prahlaad , dhroo , and other indian historical figures. That doesn't mean we're a sect of hindu right ? SAME happens in dasam granth when Guru Gobind Singh ji is revealed to by God that previous "avatars" all did karaamat to prove themselves brahm . God likes recapping u can say ! and muslims consider him a prophet , and his mother mary to be the most pious woman . Muslims also believe hes still alive in heaven and will return back on judgement day. I'd say let's not bother with waiting for Kalyug being over. Live the right way regardless of whatever yug it may be. Gurbani also has a very interesting mention of the number 5, when Sree Guru Ram Das says: ਪੰਚੇ ਸਬਦ ਵਜੇ ਮਤਿ ਗੁਰਮਤਿ ਵਡਭਾਗੀ ਅਨਹਦੁ ਵਜਿਆ ॥ Panchae Sabadh Vajae Math Guramath Vaddabhaagee Anehadh Vajiaa || पंचे सबद वजे मति गुरमति वडभागी अनहदु वजिआ ॥ The Panch Shabad the Five Primal Sounds vibrate with the Wisdom of the Guru's Teachings; by great good fortune, the Unstruck Melody resonates and resounds. Sat Sree Akal. Punjab is the land of 5 rivers / waters. The unstruck sound current of the Shabad vibrates and resounds in the Tenth Gate; the Ambrosial Naam trickles down there. ||2||[1002-6] The Dasm dwar appears in the Granth sahib at many places. I shall be garteful if members can throw some light on this. Along with Guru Granth Sahib and Dasam Granth the Khalsa has one more Granth, Sarbloh Granth or the all iron* Granth. Sarbloh is a fitting name for the Granth as this age, which we live in today, is known as "Kal-yug" (the dark age) and also the Sarbloh age. Especially due to its heavy reliance on metals. The history of the Granth is spaced over a period ranging from "Sat-yug" (age of truth) to our present age. The creation of the Granth began in Sat-yug at Nanded where Hazoor Sahib is located today. Oral tradition states that Sanyasi Brahma-Anand in Sat-yug lived at Nanded and compiled the Granth after the events which he saw during his Bhagti. As he was leaving his physical form his nine disciples asked him for mukti or liberation. Brahma-Anand told them that even though he was liberated he could not grant liberation, only Guru Nanak Dev Ji could do that. Yet maharaj's time was very distant. He would only be manifested in Kal-yug. He told his nine disciples that when Guru Nanak Dev Ji came in his tenth form (Guru Gobind Singh Ji) only then would they receive liberation. When the disciples asked how they would identify Guru maharaj, Brahma-Anand gave them his gutka and did ardass that when Guru Gobind Singh Ji came in Kal-yug he should ask for the gutka until then all nine would not be affected death or any other worldly matter. Hence maharaj met the nine in Kal-yug at Nanded, received the gutka from them and granted them liberation. To this gutka he added his own compositions and it was this which became Sri Sarbloh Granth. Many Gursikhs and Udasi scholars have undertaken an extensive study of the Granth and concluded it is from the hands of Guru Gobind Singh Ji. However it may contain verses from other poets similar to Bhatt Bani in Gurbani. Sarbloh in this case is being used as a name for the lord. 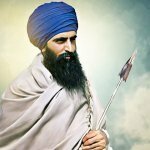 Not only is the Granth in praise of the power of the lord it also includes references to the present form of the Khalsa. It boldly answers the doubts raised on the 5 Kakkars today. Sri Sarbloh Granth Tika, Second Volume, page 495 ਸ੍ਰੀ ਸਰਬਲੋਹ ਗ੍ਰੰਥ ਟੀਕਾ, ਭਾਗ ਦੂਜਾ, ੪੯੫ ਅਕਾਲ ਪੁਰਖ ਕੀ ਆਗਯਾ ਪਾਇ, ਪ੍ਰਗਟਿ ਭਯੋ ਰੂਪ ਮੁਨਿਵਰ ਕੋ ॥ By the command of Akal Purkh, [the Khalsa was created] with the form of [sacred] Muni's. * *Ascetics. ਜਟਾ ਜੂਟ ਨਖ ਸਿਖ ਕਰ ਪਾਵਨ, ਭਗਤ ਸੂਰ ਦ੍ਵ ਰੂਪ ਨਰਵਰ ਕੋ ॥ With the long hair from the topnot to the nail of the toe, like a Muni, and the form of both a devoted worshipper [bhagat] and warrior [soor]. ਚਕ੍ਰਵੈ-ਪਦ ਦਾਤ ਧੁਰਿ ਪਾਯੋ, ਧਰਮਰਾਜ ਭੁੰਚਤਿ ਗਿਰਿਵਰ ਕੋ ॥ The 'Chakarvarti Raj' [Kingdom which is victorious wherever the Army is present] has been given by the Lord, not even Dharamraj has been given such a high status ਉਦਯ ਅਸਤ ਸਾਮੁਦ੍ਰ ਪ੍ਰਯੰਤੰ, ਅਬਿਚਲ ਰਾਜ ਮਿਲਯੋ ਸੁਰਪੁਰ ਕੋ ॥੪॥ From where the sun rises to where it sets, across all the oceans, [The Khalsa] has received the timeless Raj [kingdom] from Sachkhand ਪੰਥ ਖਾਲਸਾ ਭਯੋ ਪੁਨੀਤਾ, ਪ੍ਰਭੁ ਆਗਯਾ ਕਰਿ ਉਦਿਤ-ਭਏ॥ The Panth Khalsa has been created Pure, under the permission of the Lord, [the Khalsa] is shining bright [of purity] ਮਿਟਯੋ ਦ੍ਵੈਤ ਸੰਜੁਗਤਿ ਉਪਾਧਿਨਿ ਅਸੁਰ ਮਲੇਛਨ ਮੂਲ ਗਏ॥ Duality [in the mind] was destroyed, they attained the highest position and became One [with the Lord], the root of their bad *[asur malech] qualities were destroyed. *Asur [demons] Malech [invaders] can also refer to the Turks at the time who were destroyed by the Khalsa. Or an enemy/opponent that is prevalent today and is attacking the Khalsa or the weak and the poor. Many translate this to be cow-killers. Cow in Gurmat is a symbol for the defenseless, not the beast itself. ਧਰਮ ਪੰਥ ਖਾਲਸਾ ਪ੍ਰਚੁਰ-ਭਯੋ, ਸਤਿ ਸ਼ਿਵੰ ਪੁਨਯ ਰੂਪ ਜਏ ॥ The manifestation of Panth Khalsa's Dharam [was created], they are the form of truth, liberation and purity. ਕਛ, ਕੇਸ, ਕ੍ਰਿਪਾਨਨ ਮੁਦ੍ਰਿਤ, ਗੁਰ ਭਗਤਾ ਰਾਮਦਾਸ ਭਏ॥੫॥ Kach, Kesh, and Kirpan – these three signs made followers of the Guru the servants [also] of the Lord ਕਾਲ ਉਪਾਸਕ ਛਤ੍ਰਿਯ ਧਰਮਾ, ਰਣ ਕਟਿ ਕਸਿ ਪ੍ਰਧਾਨ ਅਏ॥ Worshipers of Death and followers of the Kshatriya way*, wearing a waistband [kamarkasa] they [the Khalsa] are the supreme warriors. *The way of the TRUE warrior as ordained by Guru maharaj. Not the Hindu warrior caste. It is said that while the panth respected and recited from Guru Granth Sahib Ji, Dasam Granth and Sarbloh Granth it was in "Chardi-Kala" (or high spirits). However with the advance of the British and an all out attack by Brahminical forces the Dasam Granth and Sarbloh Granth were slowly forgotten and hence the Khalsa lost it's source of "Bir-Rass" or warrior spirit. The Granth is divided into five chapters. It notes the power of Akal Purakh and how he created demons to remind the Gods and Goddesses of their status and place in the religious hierarchy, with him God being at the top. ‘In the time of Satjug in order to humble the Devte (God inclined beings), Akaal Purakh (the Timeless being) created a mighty demon called Brijnath who defeated the Devte and became ruler of the three worlds. Listening to the plea of the Devte, Akaal Purakh came to the earth as Sarbloh Avtar to defeat Brijnath. Sarboh (pure metal) serves as a reminder of this great symbolic event and purifies the mind, body and soul. For this reason its properties and practical application plays an important part of the Khalsa’s traditions .’ (Nihang Sher Singh, Audio Recording June 2009). Five chapters of the Granth: Chapter One: This chapter contains the praises of Akal-Purakh and his shakti. It also starts of the tale of the Gods and Goddesses and their foes, the demons. On seeing the rise of the demons all the gods and goddesses run under the protection of Chandi, for it was she who had defeated the demon Bhimnad. Chapter Two: Waheguru has created Bhimnad and his brother Brijnath. Bhimnad's wife over the defeat of her husband prepares to become a sati, while Brijnath prepares for war against the Gods and Goddesses. Chapter Three: The demons inflict a smashing defeat on their opponents. Vishnu sends as his ambassador, Narad to negotiate with Brijnath. The latter however is in no mode to listen. Especially since in the beginning of the battle he lost 11 infantry armies. Chapter Four: A massive battle starts in which Vishnu gives amrita (elixir) to te fallen Gods and Goddesses in order to raise them. Indira manages to capture the demons but this victory is short-lived especially when Brijnath caputres him. Chapter Five: After encountering massive pain and a humiliating defeat all the Gods and Goddesses plead before Akal Purakh to assist them. Akal Purakh manifests himself as Sarbloh Avtar and chooses Ganesha as his ambassador. Ganesha is sent to Brijnath as Sarbloh Avtar's ambassador. Brijnath once more ignores an ambassador and the battle restarts. The Gods and Goddesses use all their powers to call on Sarbloh for assistance. Sarbloh gives assistance to both demon and God alike. Brijnath soon starts praising him, it is then that Sarbloh manifests himself in a aggressive and terrifying form. In the battle which ensues Brijnath is vanquished and annihilated. The Granth should not be interpreted as being solely a record of mythical battles. It depicts, metaphorically, the continuous battle between good and evil which occurs in accordance with the lord's will and joy. It is also a genealogy of warrior clans which have perished over time. It is a commen misconception that "Khalsa-Mehma" (praises of the Khalsa) is found in Dasam Granth. In reality it is found in Sarbloh Granth. The Granth pays homage to Akal Purakh and his power and the Khalsa which is his army and a physical embodiment of him. Nanded, today, contains many birs of Sarbloh Granth which are historically important such as Mai Bhag Kaur's Bir; which is in the hands of Guru Sahib himself. 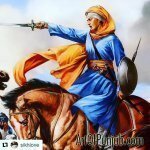 Waheguru Ji Ka Khalsaa Waheguru Ji Ki Fateh! My dear sister, I can understand what you must be going through. I know you are aware that those things are not right, but it is hard for you to stop. If you want to stop everything, you have to become a strong singhni. You have to do lots and lots of naam simran, baani, alll the nitnem paath, ardaas to Maharaj ji. Once Guru ji does so much Kirpa, your surti will start to become more and more pure. Waheguru ji is the purest! His children start becoming like Him with more Naam Kamaai. Think about how much Karam you are making! Our karams are already soooo soooo much from so many previous life times! This is your life to kill all those karams and not make more karams! When we look at others and think about maya, we do keep on making karam. In Anand Sahib Guru Sahib says your eyes were not even made to see these things! They were made to see Waheguru ji! There is a saakhi, forgive me I dont properly remember. In the olden times there was a very "beautiful", proudy women. Everyone in te village used to look at her. But Kabir ji was the only pure one there. She would be very proud of her beauty and apply mascara on her eyes and go out. After a long time when she died, Kabir ji was passing and saw a skull in which the sockets where eyes are, were filled with ants. Kabir ji said that once this women used to put mascara in her eyes and on the same places now ants live here. It was something like that. In our generation, we are bombarded by images from adds, media so so much. Guys have wallpapers of cars on their laptops, women can't resist to look at model's posters again while passing somewhere. Try to recognize maya. If we do not know what is maya we keep doing wrong. Maya is all the model's picture we see, the tv dramas we see about relationships, even the non-khalsa colors we see! All our 5 sences are DRIVEN by maya... we take a second breath when smell some scent.. the songs we hear are wrong too. Once Mata Sulakhni ji came to Guru Nanak Dev ji and did not look too happy. She said all the women around her wear fancy clothes, but she only wears white suit. Guru Sahib ji said not to look at them, and stay in saadgi. It is all in our itihaas that Guru ji dosnt like all those decorations. So many time in Gurbani Guru ji mentions jewellery. You are Guru jis daughter, you have to listen to Guru ji. Do you think Mata Sahib Kaur ji wore make up? You should look like your Mata ji! Even thought we are born in such Kaliyug, Guru Sahib still keeps on doing soo soo much Kirpa! I know Gursikhs our age who do not many things because they have FELT that these indeed disturbs your soul alot... They don't watch TV ( Don't even have Tv in their house), don't go to malls (there is SO MUCH disturbance happens to your soul in that place filled with loud noices and SO MUCH MAYA), don't have manmukh frnds ( Kabir jir said what do I talk to worldly people, they don't know about God. And all I talk about is God). Also, we aren't really showing people how Amritdharis are suppose to be. I am telling you how it effects me. Truly, I don't want to be rude with you, my sister, but it really is disturbing for me when I see girls with keski wearing dresses. Please please don't wear dresses if you can. When I look at them.. I just can't seem to see them as Guru Gobind Singh ji's Daughters. I have tried so many times to see them that high, but I just can't seem to do that. I see girls doing Keertan at Gurdwara, my heart kinda sinks. Once I was trying to prove my family that Gursikhs are not suppose to wear jewellery. I was trying to convince my mom to wear them off. After a month my mom came with a Gurdwara calender which had a pic on women with keski wearing a big necklace. I did'nt have anything to say. I work with people and our manager ties Dastaar but does her eyebrows. My co-workers are punjabi aunties, and they talk how Amritdharis are fake. Once me and my friends were doing veechar about khands, and one girl said I am so bad that wen I think about Sachkhand, I think it is filled with bags and purses! I am sorry, my intention is only to explain how people get effected by this, but I really respect you for who you are. Do 1 hour Simran, do Ardaas to Guru ji, then throw away all your cosmetics into garbage. Just do that. You want Guru ji to stand beside you when you go to Dharamraj. You don't want to take birth again and be more separated from Waheguru ji. Also, SANGAT MATTERS!!!! Have Gursikhs sangat and eliminate manmukh frnds who bring maya vibes to you! WJKK WJKF So couple days back a cousin of mine got into a really bad wreck in India. He was driving a dumper truck and the truck got into a huge accident and flipped over. He was rushed to a hospital and the doctors said he had a huge clot in his brain. He was unconscious(well only moved his legs once in a while. No sedation medz were working on him)for three days and everytime the doc were going to do a CT Scan he would start to move and they weren't able to do the scan. They tried 3 times without any success. Family was told that they were going to try to do a scan one last time because the longer they wait the worse it could get and therefore would have to do an operation. All the family was doing ardaas and paath day in and out and due to Guru ji's miracle the blood slowly started to thin out, he gained consciousness, started to talk a little bit and eat! Now this cuz of mine has done a lot of drinking and drugs in his life and never was religious at all. I'm sure this opt to teach him a lesson to reconnect with Guru ji. I believe that Guru ji makes us go through situations like these so our faith becomes stronger in Gurbani and Guru ji.